Three-car Class 150 DMU 150927 was presented for service again for the third joint collaboration railtour between the Branch Line Society and The Locomotive & Carriage Institution, when 161 members of both organisations enjoyed a highly unusual day out railtouring courtesy of First Great Western. The highly successful fixture helped raise almost £2000 for some very worthwhile causes and charities. Leaving platform 6 of Exeter St David’s a few minutes down we effected a prompt reversal on the Down Main on the flood channel overbridge before we were able to enjoy our first highlight of the day, road 12 of Exeter TMD where we travelled to the buffers. Our thanks are recorded to the depot staff for preparing the road for us. Next we ventured over new metals at Dawlish following the storm damage rebuilding project that led to the deferment of the charter, and were delighted to run wrong road over the Up Main to Teignmouth. Passengers enjoyed observing the Great Western liveried camping coaches still used for holiday makers at Dawlish Warren and managed by the Great Western Railway Staff Association. At Newton Abbot we were routed through platform l before arriving at Laira Depot, where our shunter met up with us by arriving in the cab of a Class O8 - some passengers thought we were getting rare haulage! We travelled over Embankment Siding No 4 including the tank spur before reversing and traversing “dead end” road Siding No 7 stopping short of the buffers due to stabled coaching stock. As on previous trips we next avoided the carriage washer by taking the Up road to the end of the line at Plymouth Friary where we ran right to the buffers, before reversing to take the Cattewater branch. At this stage we must record our huge thanks to Tim Maddoeks and Barry Trout from Network Rail and Bill Monteith from First Great Western for making the trip over the Cattewater branch actually happen. We were the first passenger train in almost 15 years and many believe we were likely to be the last - a significant amount of effort had gone into this particular part of the programme so we were delighted to exceed expectations by continuing through the EMR scrap yard gates to reach the very end of the current infrastructure. The Great Western Tracker III railtour is seen at the stop blocks on the remains of the Cattewater branch. Staff from both Network Rail and First great Western (which includes no less than four L&CI members) pose to mark the occasion of the first passenger train in almost 15 years to traverse this section of line. Running back to Friary, the road was set for us to head out towards Plymouth via Mount Gould Jet and Lipson Jet. After a leg stretch break in Plymouth, Lostwithiel DGL and Par DGL were completed as booked before calling at Par to enjoy our hot Cornish pasties made by Pearn’s of Par - gone in no time! Our thanks to Jimmy James, Publicity Officer of the Bodmin & Wenford Railway for arranging this lunch time treat and for joining our train at Par to raise awareness of the scenic heritage line. For the next attraction, we made our way to St Austell where Network Rail staff met the train to oversee a departure from the Down platform, over the crossover and in to the Up Siding to just short of the buffers. For some reason, the Exeter end of the DMU Hlled up with micro gricers! With that move duly completed, we made off for Penzance No 2 Oil Siding. After arrival at Penzance, a shunt was undertaken to complete Long Sea Siding to the operational limit before reversing in platfonn 4 to make the trip over to Penzance T&RSMD. We covered the West End Carriage Reception to just short ot`the Wash Plant and Up Loop "Slopers" Siding, before arriving in platform 2 for a refreshment break and an opportunity to clean the train. During the refreshment break, the crew agreed to shunt the train from platform 2 ready to depart from platform 3 again via the Carriage Reception l.ine, meaning the charter covered 75% of Penzance’s platforms in one visit! With everyone refreshed, it was time to make for Exeter but with a few diversions en route. 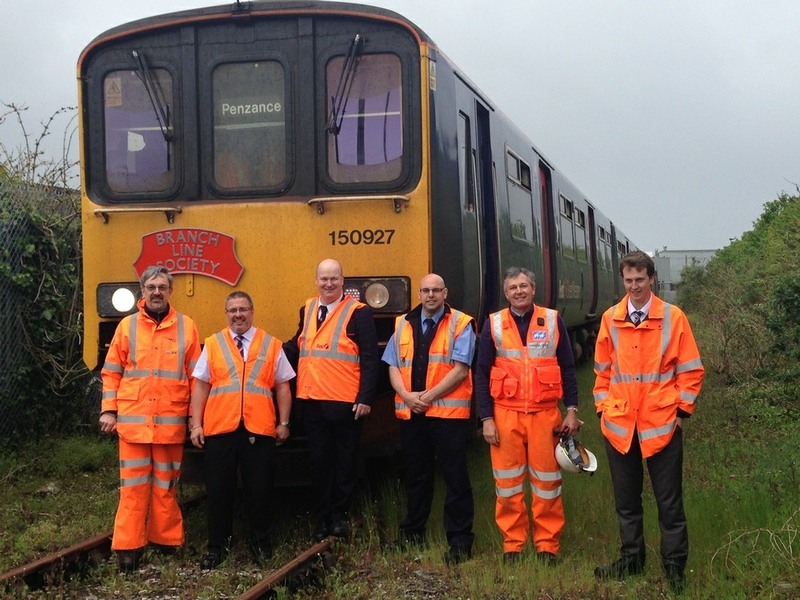 First stop was Truro Yard where Network Rail staff had prepared road 6, which we duly traversed to the buffers. To follow, we made for Par where we ran to platform 3 before completing Chapel Siding to the end of the line. A trip up to St Blazey Signal Box followed via Par platform 3, allowing us to reverse and complete thc unusual crossover there before making our way back to Par, taking the sought after Through Avoiding Line. With Lostwithiel UGL under our belts we arrived at Bodmin Parkway to he greeted by Network Rail staff and Bodmin & Wenford Railway Operations Manager Phil Hawke. With the tremendous help from both parties, including a full possession being taken of the B&WR, we completed the Exchange Siding in hill AND the short spur that connects the two organisation’s infrastructure. For those members who participated in the Branch Line Society trip to B&WR in November 2013, the combination of operations ensured all track over the connection could be “red penned”. As much as we would have enjoyed running on to B&W R metals, sadly insurance matters prevented this. We said our farewells to Jimmy James and made our way to Plymouth, departing Bodmin Parkway right time. Of coursc, every excellent charter needs a finale, so we popped into Dock 4 at Plymouth for a quick stop to set down the catering trolley before reversing on Cornwall Loop Viaduct and proceeding back home to Exeter via Plymouth platform 8. With 275 miles and l chain under our belts, we waived our goodbyes to the train crew, stewards and passengers. To conclude, thanks must go out to everyone who made this very special charter happen - not least of all Stuart Smith, a Driver for First Great Western at Plymouth, Editor of The Locomotive & Carriage Institution newsletter and not least a prominent BLS member, who was the original “driver” behind the Great Western Tracker series of fixtures. The list of those to thank is almost endless.